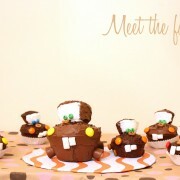 I was thrilled when I saw picture of these cupcakes… They are so cute. 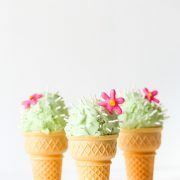 Just wondering when will I be able to make these. Look at the bees and lady beetles. They are so cute. 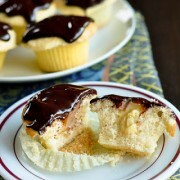 Not too long, these cupcakes have stolen someone heart too. Yes I said. 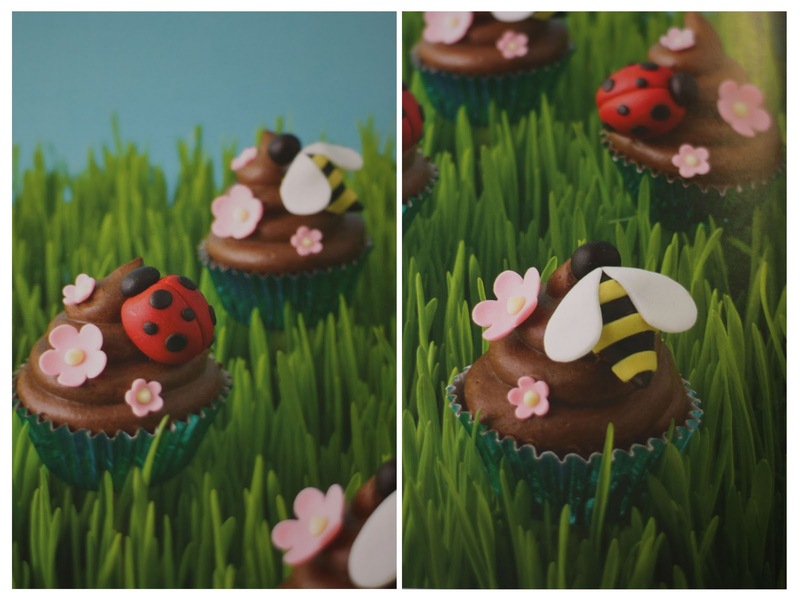 These pages are from the book Confetti for Kids by Elisa Strauss. 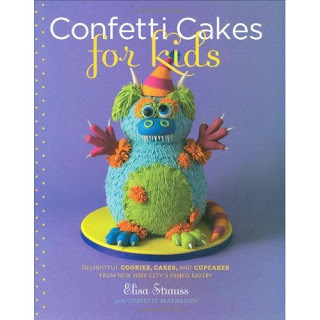 Thanks for my sister in law who lend me this book, or else I would be crazy designing cupcakes for Florencia…(which I had for the past few weeks). Heat the heavy cream in suacepan over medium-high heat. Stir frequently until it starts to boil. Remove pan from the heat and pour over the chopped milk chocolate. Let the mixture stand for 2-3 minutes. Stir the mixture with a whisk until the chocolate is completely melted and there are no noticeable traces of cream. Allow mixture to sit at room temperature and thicken. Storing: When ganache is cool, store it in an airtight container. Tip to thaw refrigerated ganache: Heat in a double broiler over low heat. Now this is the TWIST I made. 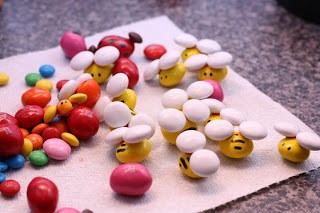 Instead of making the bumblebees and lady bettles with fondant, I made them with M&M. 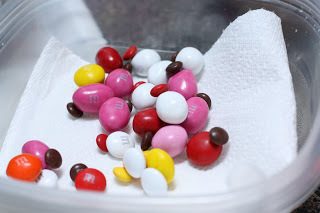 ; (Luckily, the white M&Ms; are available in the Valentine package so I don’t have to buy a box of whites only). candy coating – I use red so you can see how I attach the body to the wings. Trust me I tried different way and this is the easiest. Put the white M&Ms; down with the letter M facing up. Place a drop of candy coating. 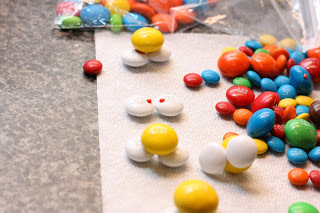 Attach the yellow M&M; with the letter M facing up. Draw couple stripes on the bee body and eyes and you are DONE. 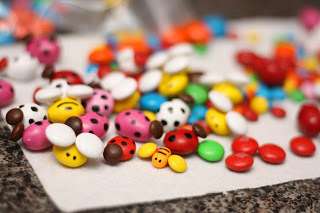 Drop a small dot candy coating on the body, then attach the head. Finish with drawing small dots on the body. I also use pink and white for the body. The birthday is not til next week so come back for the finish cupcakes. I am still thinking how to TWIST the flowers without using fondant. 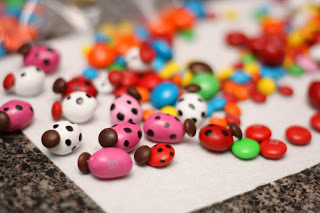 I can use pink and yellow M&M; but it’s too much work to attached them together. We’ll see what I come up with between now and then.